Information and tips about exterior house painting. How to receive the longest life you can from your next exterior house painting project. The first job our Painting Contractors in Brandon must complete when painting your home is to prepare all of the surfaces to be painted. To maximize the adhesion and the life of the paint, the surface should be clean and free of cracks, oxidization and mold. Old paint that is oxidizing will leave a white chalky residue on your hand when wiped. Molds and algae must never be painted over and should be bleached thoroughly before any coating is applied. Pressure washing with a high pressure machine approximately 2500-3500 psi after a thorough application of bleach mixed with Tri-Sodium-Phosphate through our dedicated chemical pumps will remove oxidation and old flaking paint. Many times, a second application of detergent is needed as layers of old paint are removed exposing molds. Our painters will then trench the lower portion of the exterior and apply detergent as this is always one of the first areas to get moldy. 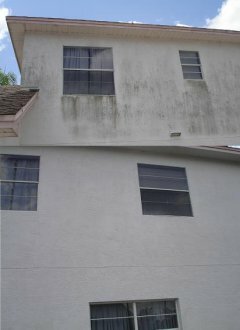 This would be a good time for a Tampa roof cleaning as well, to make sure the entire property is free of algae and molds. Once the exterior is dry and clean, we can begin scraping where needed. The next step our Painting Contractors in Valrico must complete in preparation to paint is to caulk and seal the exterior. Thoroughly caulk all cracks with silicon sealant or a patching compound as needed. After the caulk has had time to set, paper is taped to windows and exterior portions not to be coated. A water based acrylic sealer is applied with a airless sprayer to the entire exterior. This will ensure good adhesion to the surface and seal out moisture. Now that we have the exterior of the house cleaned and sealed, we are ready to apply paint. Two coats of premium paint sprayed and back-rolled by our professional painters of your favorite colors will make your homes’ exterior look clean and new for years. Satins will be easier to clean and will last longer in the hot Tampa climate. A simple application of bleach and a soft rinse of water is all that will be needed to keep the paint looking new for years.